“They’re Watching” is a 2016 found footage film written and directed by Jay Lender and Micah Wright. 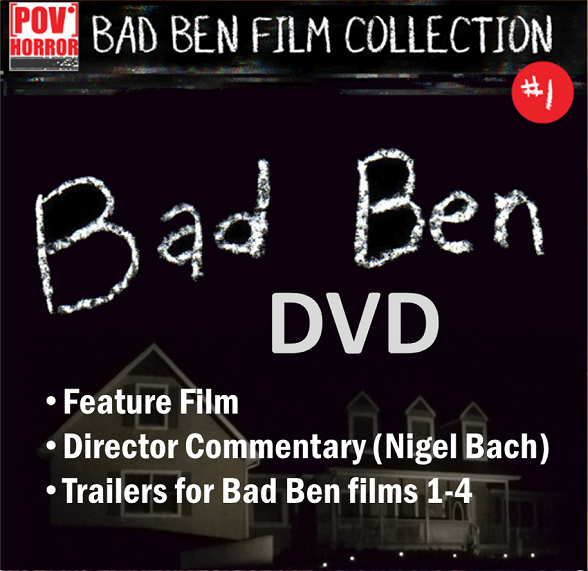 The film is a horror-based parody of the HGTV series House Hunters International. They’re Watching starts with a cold open where a panic-stricken woman is chased down by a police officer in the woods The officer unceremoniously impales her in the head with a hatchet. Next, the officer draws his gun and fires upon the unseen male holding the video camera. From here, the upbeat opening credits play to the fictitious show Home Hunters Global with Kate Banks. 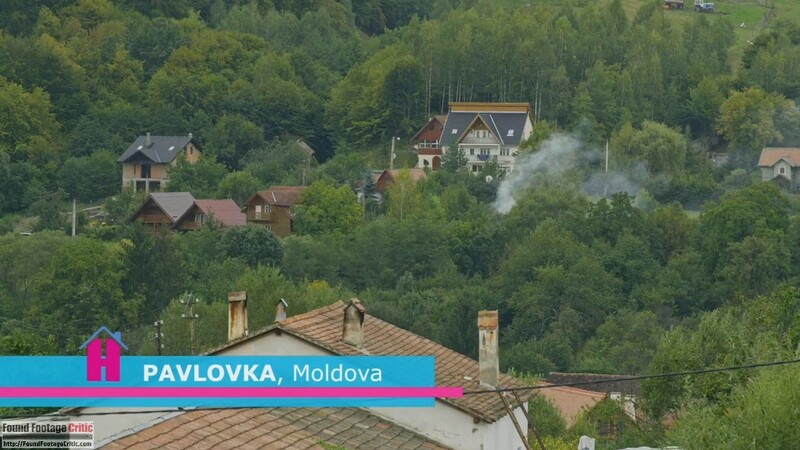 In a scene that could have been lifted straight out of House Hunters International, the show moderator introduces the featured country on this “episode,” which is Maldova, located in Eastern Europe between Romania and the Ukraine. Without missing a beat, the moderator introduces the lucky couple. Becky (Brigid Brannagh) is an artist and potter who is looking to move from the hectic Los Angeles craft scene to a quieter, slower-paced lifestyle. She wants a house with a pottery studio and room to raise a family. Her significant other is Goran, a professional soccer player. Through some additional narrative and footage, we see Becky and Goran enjoying life and looking forward to their move to Maldova. Click here to read our interview of the They’re Watching writer/director team Jay Lender and Micah Wright! 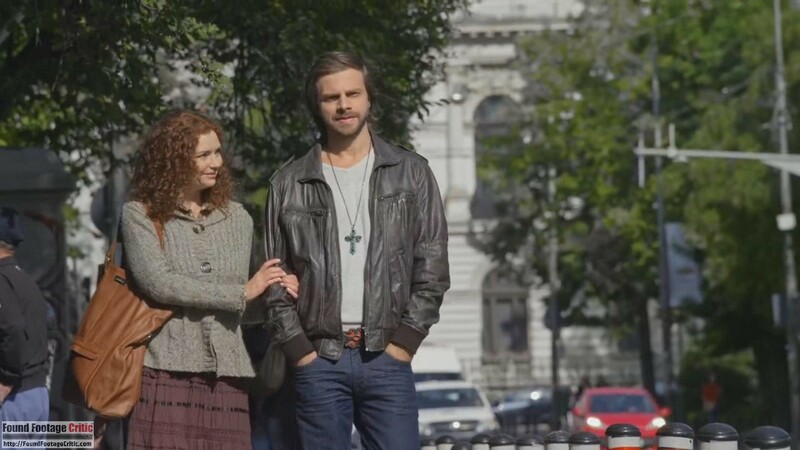 Last, but not least, real estate broker Vladimir (Dimitri Diatchenko) is introduced who will help Becky and Goran find their dream home. Vladimir self-proclaims himself as not only the “best broker” in Maldova, but also the only broker in the country. Vladimir shows a home to the couple that is located in the remote farming hamlet of Pavlovka. Goran is dismissive of the house due in large part to its dilapidated condition. Becky, however, sees the potential, immediately falling in love with the property. Vladimir highlights the ample-sized cellar that would make a perfect pottery studio. While in the cellar, Becky sees what appears to be a painting etched on the floor, the subject of which is hidden under hay and other debris. With her mind made up, the couple purchase the house. Following the show’s formula, the moderator says that they will visit the couple in six months to see their renovations and learn how the couple are making out in their new home. When the film crew returns to Maldova to check up on the couple, what they experience is unmistakably funny, disturbing, and absolutely horrific. As mentioned at the start of this review, They’re Watching is a parody of the HGTV series, House Hunters International. In a scant few episodes of House Hunters International, the featured couple considers a dilapidated house of similar condition to the one used in They’re Watching. Despite the overwhelming similarities to House Hunters International, They’re Watching deviates from the established formula by showcasing only one house (rather than three). 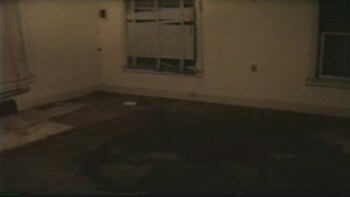 The film gives the impression that there are perhaps other homes the couple looks at which are simply not included in the found footage. The cinematography in They’re Watching is extraordinarily well-done for most of the film, but falters in the last act, where the film loses much of its found footage conceit through the aggressive use of background music and CGI. All of the footage captured throughout the film is shot with either a professional video camera, consumer-grade handheld camcorder, or body-mounted video camera. The handheld video camera is equipped with night vision, which is used somewhat sparingly in the final act of the film. They’re Watching also includes the Home Hunters Global opening credit sequence and publish-ready footage with background music and voiceovers clearly shot before the couple purchased their home. The final feature film is a composite of raw found footage and this post-production footage—presumably edited by the studio responsible for producing the show. The raw footage contains some background music early one, which escalates in frequency and intensity by the end of the film. While a third party may have conceivably added subtle background music to the early raw footage scenes, given the reality TV nature of the film, the music in the last act is completely unrealistic. The visual cinematography is well done, as should be expected since the characters capturing the footage are all professionally trained filmmakers. Lead cinematographer Greg (David Alpay) performs most of his filming using a professional video camera, which he says is valued at $40,000. The freshman of the group, Sarah (Mia Marcon), films primarily with a consumer-grade handheld video camera. As the junior member of the crew, she is relegated to filming B-roll and behind the scenes footage. Both Greg and Sarah also take turns wearing a body-mounted video camera as circumstances warrant. The latter part of the film contains a surprisingly large number of CGI effects for an independent horror film, particularly in the found footage genre. While the CGI effects are highly entertaining, many of the effects look like obvious CGI rather than something natural to the environment. The film would benefit from perhaps putting more resources into fewer CGI effects that are more photo-realistic. They’re Watching also has a healthy dose of practical gore effects, which are well done. The filming reasons used throughout They’re Watching are exceptionally done. First and foremost, the film crew is in Maldova for the sole purpose of shooting a reality TV show. The group only have forty hours to stay in Maldova before moving on to their next episode. As such, they need to film everything as time-is-money. The film crew can’t afford a missed opportunity by failing to have the cameras recording. During the latter part of the film, the filming reason takes a different turn. The circumstances compel the film crew to capture everything as evidence of the rather strange and horrific events taking place. They’re Watching contains a few scenes in the privacy of the characters’ hotel rooms where the filming reason is questionable. The characters explain this away by expounding their personal desire to film everything. The found footage purity is a composite of the cinematography, filming reason, and other factors. But not for the background music and CGI used during the found footage portions of the film, They’re Watching would be labeled as pristine pure found footage. As the film stands, the barrage of escalating background music and heavy-handed CGI compromise the found footage conceit of They’re Watching. This critique is not a knock on the film itself, which is a very entertaining horror film. Found Footage Critic measures and rates films for their found footage technical correctness, which They’re Watching has difficulty achieving at times. The acting in They’re Watching is phenomenal. Mia Marcon performs exceptionally as Sarah—most of the film is told from the lens of Sarah’s camera. Sarah is fresh out of school and is participating in the show production as an outsider. Mia Marcon credibly portrays a recent film school graduate who is eager to work and makes mistakes from her inexperience, often without realizing it. 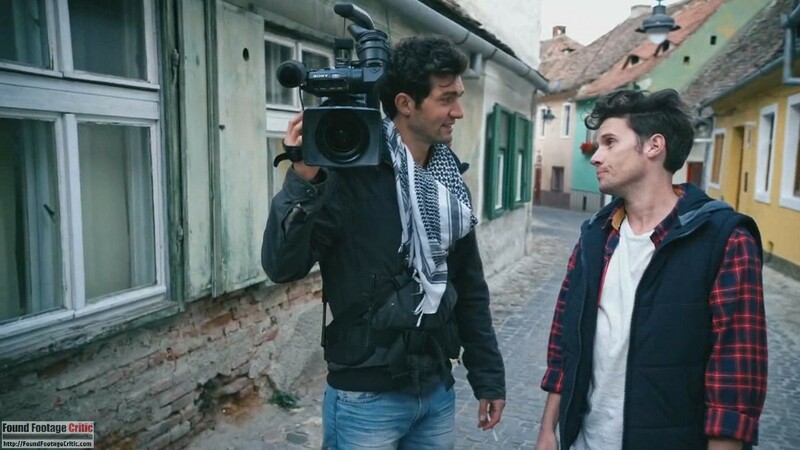 David Alpay kills it as Greg, the veteran cinematographer carrying a good deal of emotional baggage from his past. His character has great chemistry with Sarah—the two actors (and characters) get along wonderfully during their shared scenes. Kris Lemche as Alex performs remarkably as the boom operator and jokester of the group. He has a humor and dry wit that plays well off the other characters. Alex has an unspoken rivalry with Greg—from which the two actors do a good job conveying subtle tension. Kris Lemche is not new to found footage genre as he also starred in the fan favorites Frankenstein Theory (2013) and My Little Eye (2002). While the characters Sarah, Greg, and Alex hold themselves as consummate professionals throughout the film, they always find ways to have fun when their relentless and seemingly heartless supervisor, Kate, is not around to micro-manage their activities. Carrie Genzel as Kate, the host and star of Home Hunters Global, is great as the bitter and often nasty boss to Alex, Greg, and Sarah. She has no hesitance tearing down and belittling Sarah whenever she does something wrong. Carrie Genzel’s character is equally as harsh with Greg and Alex and pretty much everyone else she comes in contact with. 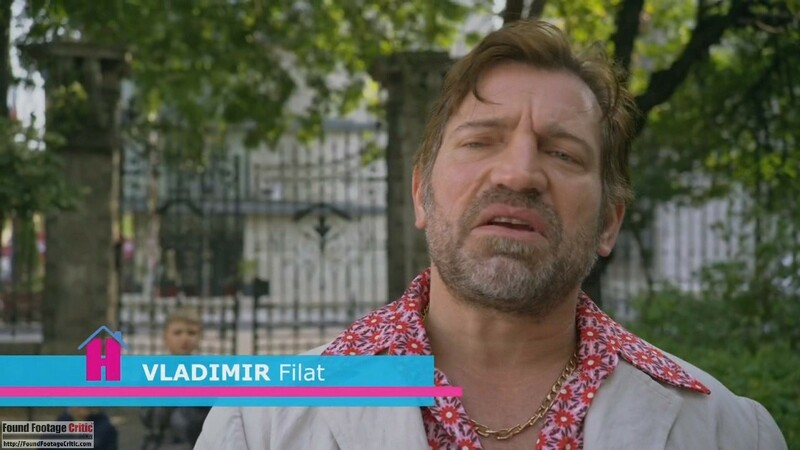 Dimitri Diatchenko does incredible job playing Vladimir, Maldova’s best and only real estate broker. He infuses a good dose of humor with the delivery of his anecdotes and mannerisms throughout the film. Most noteworthy is the reality TV show idea he pitches to Kate called “The Biggest Donkey”—an idea that’s best seen and heard watching the film rather than reading about it here. Mircea Constantinescu performs admirably as Maldova’s constable (perhaps the only constable). He does a good job playing a man trying to keep the peace as the film crew unwittingly upset the delicate balance of law and order with the local townsfolk while they shoot their show. 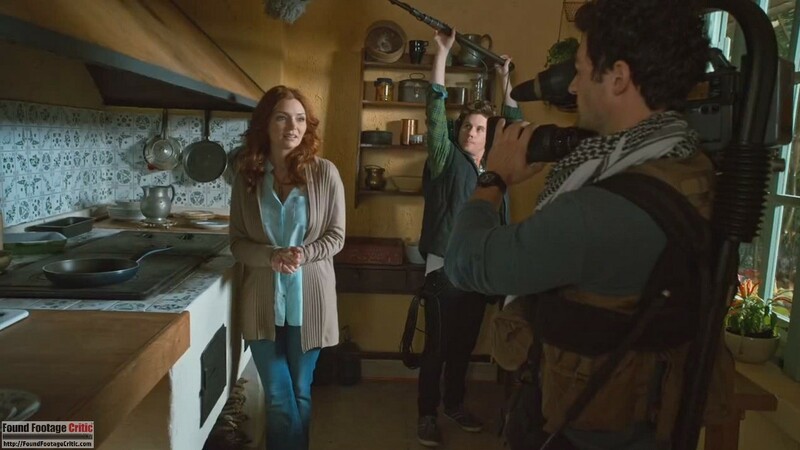 Last and certainly not least is Brigid Brannagh as Becky, who is featured on this particular episode of Home Hunters Global. She does a wonderful job replicating the mannerisms and charisma of the stereotypical buyers gracing the countless episodes of House Hunters and House Hunters International. 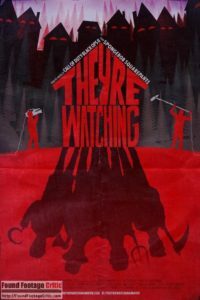 They’re Watching is a found footage film with an incredible plot and humor to match—so much so that many viewers are likely to break out laughing even during some of the more horrific scenes. While there are a sizable number of found footage films that leverage a reality TV show plot, this film is perhaps the only one parodying a popular TV show. When these factors are coupled with the film’s visually interesting sets and locations and great gore effects, what we end up with is a very entertaining and well-constructed horror film. They’re Watching is an absolute trip to watch and a thrill ride worth taking. Unfortunately, the heavy-handed use of background music and CGI take away from the found footage conceit the film sets out to achieve. Despite this misgiving, They’re Watching is a must watch film for every horror fan and found footage fan. When an American home improvement TV show visits a remote Eastern European village, the young crew thinks the lack of mocha lattés and free wifi will be the worst of their problems. But after their filming interrupts the superstitious villagers' private religious ritual, the situation takes a turn for the homicidal... and when the blood starts flowing, that's when things get really weird. With THEY'RE WATCHING, noted graphic novelists and animators Micah Wright and Jay Lender turn a classic horror premise upside down to create a fresh, funny, eye-popping twist on the found footage genre. THEY'RE WATCHING is a found footage horror film parodying the HGTV series "House Hunters International." The film has phenomenal acting and an equally impressive plot. This is a must-watch film for every horror and found footage fan.